Dr Mariama Mandara was at the beachside resort for a professional conference. Unfortunately, her other position had its own extensive list of requirements - that as princess, only child to a king in Africa. Now, she only wanted to escape the paparazzi that was pursuing her. However, she made a slight miscalculation, and found herself at the mercy of her professional adversary. Dr Rowan Boothe didn't really have an issue with Mari. He was attracted to her, considered her an expert in her field, but she did have a tendency to criticize his work. When they find an abandoned baby, they have to put any differences aside. Knowing Mari's attraction by the media will be able to get extensive coverage on this case, they decide to request custody until the officials learn the child's identity. Neither expected that playing family would ever feel so right. 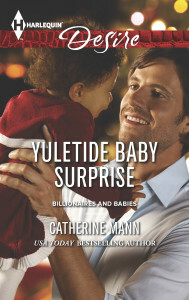 Yuletide Baby Surprise was a fun and entertaining read. I laughed reading as Mari tries to elude the royal watchers, and sighed as they both put their lives on hold to help this child. Rowan's compassion had already been quite evident in the previous Alpha Brotherhood stories, and it was going to take a very special woman to be his perfect heroine. Mari definitely was the ideal match.